This is an introductory book that examines the idea of creation in a different light. In contrast to the notion that humans are the result of creation, it explores the idea that the collective humanoid consciousness (or soul) created our universe for specific purposes. What are those purposes? Who is involved? These questions and many more are addressed, resulting in startling possibilities. 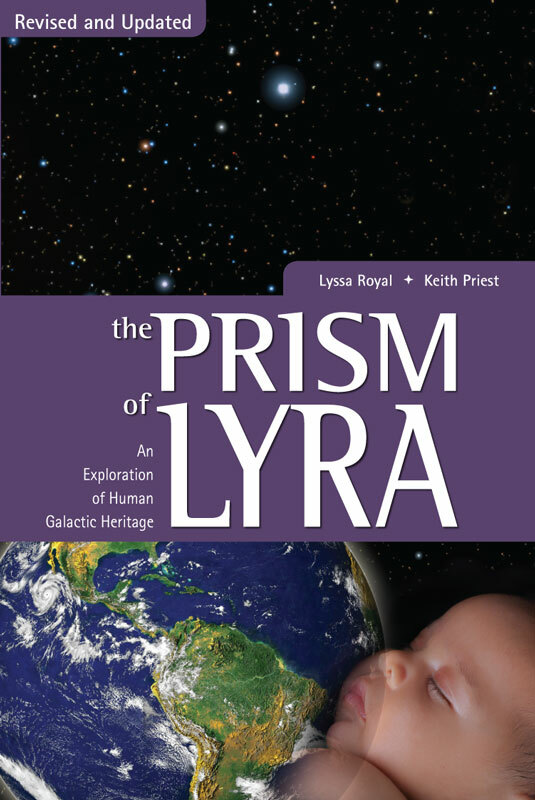 The Prism of Lyra then traces various developing extraterrestrial races (such as those from the Pleiades, Sirius, and Orion) through their own evolution and ties them into the developing Earth. Highlighted is the realization of our galactic interconnectedness and our shared desire to return home. Submitted by Anonymous on Thu, 02/14/2013 - 12:25. I bought this book to explore further a mention in the book 'Humanity's Extraterrestrial OrIgins' that ENKI a god of the Sumerian/Babylon Pantheon was a Humanoid ET from Sirius and that he was 'working' for the 'ANNUNAKI' who were from the Pleiades.and that the Annunaki were Reptoids/Reptilian.Needless to say that Enki was only a footnote in The Prism of Lyra.Something I must say,unconnected to my Enki query in the latter part of the book,which is a partial transcript of a channeling session in which Lyssa Royal channeled an 'entity' named Germane.Someone at the session asked Germane this question. "Can you tell us how many planets are populated?Maybe not just in our dimension,but how many are populated in some way throughout all dimensions? "Germane replied,"Hmm! Populated.You would have to define "populated." I think that was a really earthshattering,enlightening answer from Germane who knows all about our origins and our future.Perhaps his knowledge and understanding of English language is not 100% or maybe Lyssa,should have regular rest breaks or find a better educated 'entity' to channel.If I still had solid fuel heating in my house I would use the book to light the fire,but I'll just shred it instead.I won't bin it intact as someone might read it and insult their intelligence. Submitted by Anonymous on Sat, 01/17/2015 - 02:13. It makes perfect sense to me: There could be many different types of life forms on maybe all planets, even just energy-with-potential, but you couldn't define them as populating a planet in the 3D humanoid concept of "populated." Germane's reply is just in requesting the word "populated" be defined. And book burning is so last century!